I picked up a bottle of Barrell Bourbon at Keife & Company in New Orleans this past weekend. My Dad recently got me a bottle of Barrell Whiskey at Martin Wine Cellar down there and I will review that soon. 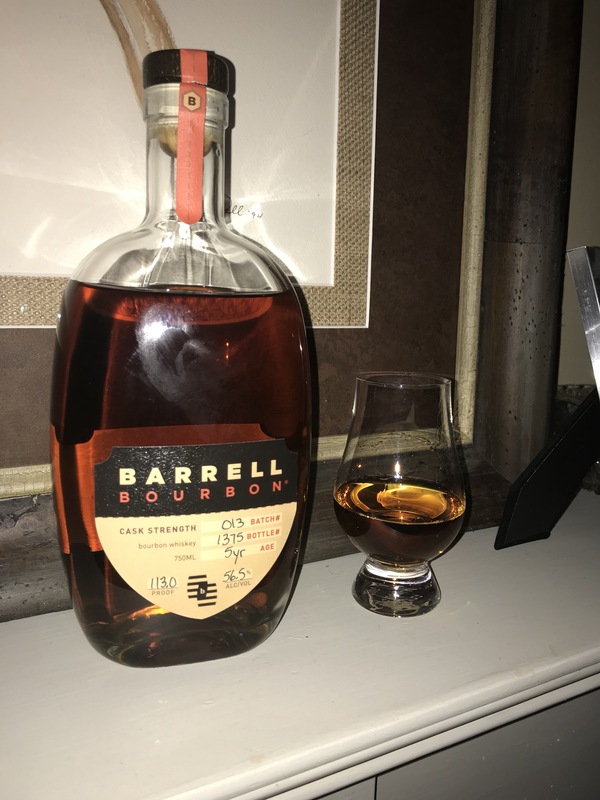 I had heard a lot about Barrell on the inter webs and I wanted to know what all the fuss was about. First of all, it is cask strength which is a big plus to me. It is a blend of high and low rye Tennessee Bourbons (think Belle Meade) and some MGP rye recipe bourbon (think Smooth Ambler Old Scout). The ages range from five to eight years, so it is not going to have the oak notes I love so much. But oak isn’t everything to cask strength bourbon, ala E.H. Taylor Barrel Proof. The color is gold leaf with slight amber tones. The color is sort of interesting actually. Nose and palate is all leather, spice and tobacco, but is missing either an oak or confectionary flavor that would really knock your socks off but this stuff is pretty good, leaving you with the feeling, yeah, I’ll have some more of that. Nice, long, slightly drying finish. For being younger than a lot of bourbons in this class and price range, you can tell a bunch of guys put a lot of thought and drinking time to blend this lovely bourbon. It leaves me with the thought I wish I had hung out with those guys to help make this. It’s a heck of a lot better than the Michter’s 10 year old, pretty much on par with the Knob Creek 25th Anniversary, and was way cheaper. It’s closest counter part is E.H. Taylor Barrel Proof. Definitely worth picking up if you can find it.